Imagine sending an email to someone residing in a remote village who has never heard about computers or internet and there's not even an electricity connection in the house. That's where ePost, a service of the Indian Postal Department, fits in. You can still reach that person via email. Here's how the ePost service works - you send an email to ePost with the postal address of the recipient. The email message is then forwarded to the nearest Post office where it is printed, enveloped and delivered by the postman like other snail mail. You can also send handwritten message through this service - walk into your nearest post office where the letter will be scanned as an image and transmitted through e-mail. All this at a cost of ~20¢ per page per addressee. And the undelivered messages are physically returned to the sender by snail mail. Now a company in Germany have taken that concept a step further - in addition to emails, they even deliver SMS text messages and printed copies of documents using the old-school postal system. 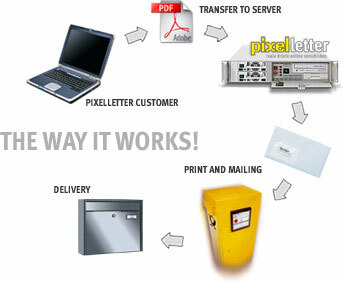 Like ePost, you type the message online or upload a document, make the payment and PixelLetter will then print, fold and envelope your letter and deliver it the old fashioned way. Europe only. 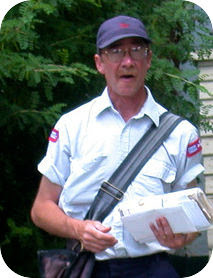 The glorious days of the good-old postman are back again. Update: There's another service called Bharatmail that allows you to send email in most Indian languages which is finally delivered as snail mail to your contact in India. Thanks Kaps.